Mind Mapping: In August we spoke about taking notes and in November we talked about training your memory. In this article we will now combine the two and show you how to bring together better memory into your studies with the aim of knowing your subject and passing exams. To start with start organising the course content: you have taken pages and pages of long hand notes; or perhaps you are using Evernote to collate your documentation; so what do you do with it all ? Long hand notes are the important first step, you have taken the content and brought it into your own words and understanding. This is so much more of a learning exercise than just photocopying the material. These pages now need to be organized and condensed and one of the best techniques for this is to draw up a series of mind-maps covering the whole course. Mind-maps have a very particular structure that plays well to human memory. You start with a central topic, theme or subject that is put in the middle of the page; lets choose ‘marketing’ for this example. 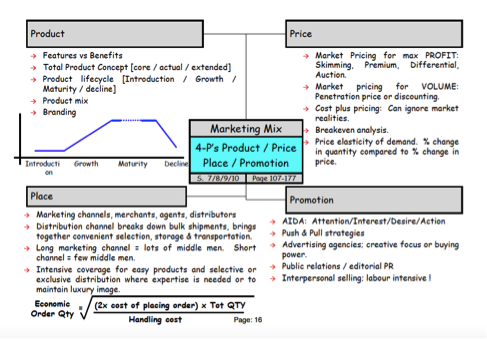 You then build outwards using the major building blocks of that subject; in this case the 4-P’s of marketing being ‘product-price-place-promotion’. These become the main headings in the four corners of the page. Now you are ready to go into the detail for each of the headings. These detail sections are the hardest to remember if you try to ‘learn’ them from cold all on their own. 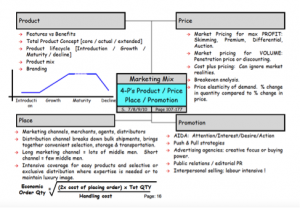 With the memory triggers of “Marketing – 4-P’s – Pricing” all leading the way it becomes much easier to remember that pricing for volume or pricing for profits are key components and that price/volume elasticity is important. With this as your example, now it is your turn. Take all your long hand and Evernote notes on a subject and condense it all down into one or two mind-maps of your own. Writing out the mind maps will help you revise the subject as you go and you will probably find that several pages of long hand notes all fit onto one mind-map. Take the time to make the mind-map good; put referencing to books and page numbers so you can refer back to original materials if you want to. A good student will make mind maps as a key-component of their studies during the course and also as a part of exam revision. With a full set of carefully written mind-maps you can even throw away all those endless pages of long hand notes and work straight from the mind maps for exam revision.